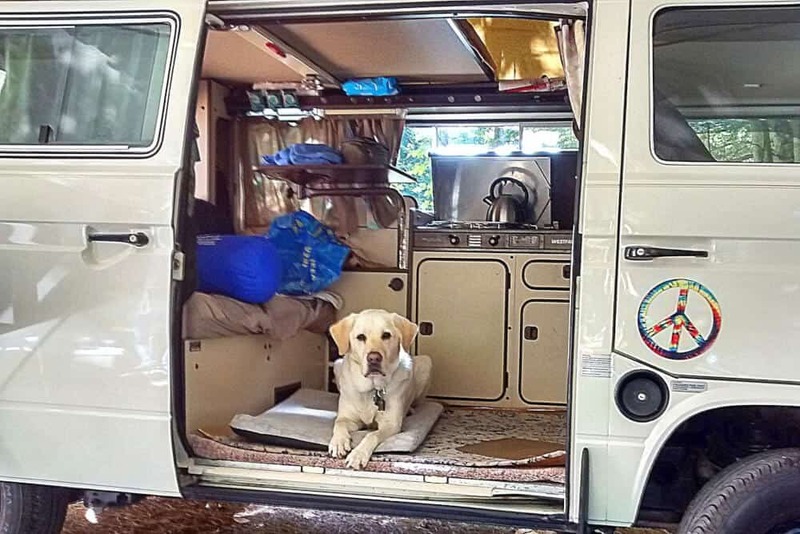 So, you’re planning a monumental road trip, and you’d love nothing more than to bring along your favorite canine companion to share in your adventures. Should you do it? Will your dog cause problems, make your life miserable, and suffer from incredible boredom sitting in the car day after day? Whether or not you should travel with dogs depends totally on you, your dogs, and your lifestyle, but I can promise you that fabulous, inspiring road trips have been achieved with adventurous dogs since the invention of the automobile. For the most part, dogs love traveling, and there’s no doubt that your pup cherishes time with you above everything else, so let’s try to make it work. First, let’s decide if travel with dogs is right for you. You have room in your car, RV, or camper. 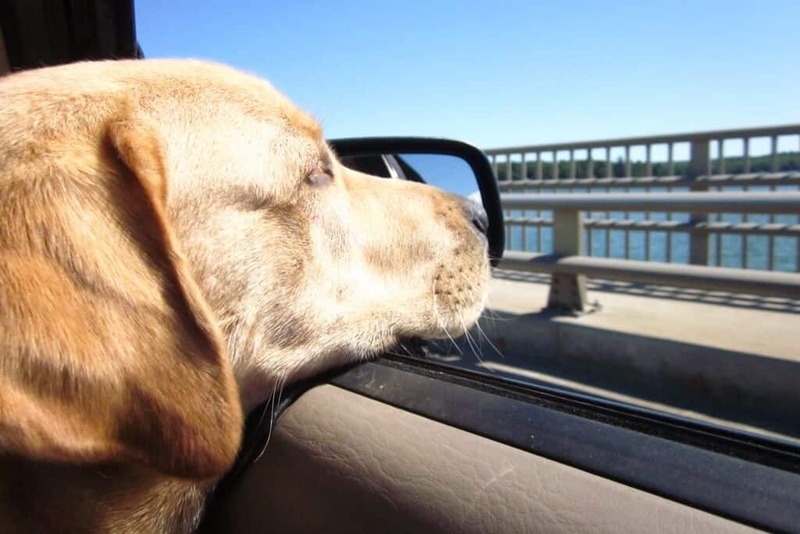 Your dog enjoys traveling and doesn’t get car sick. Your dog responds to basic commands and is socialized to people and other dogs. You are passionate about an active lifestyle. You are willing to do some research in order to find places that will accommodate your dog. You are willing to skip over attractions and destinations that aren’t dog-friendly. You are able to make arrangements so that your dog does not have to sit in a hot car while you shop, eat, or explore. 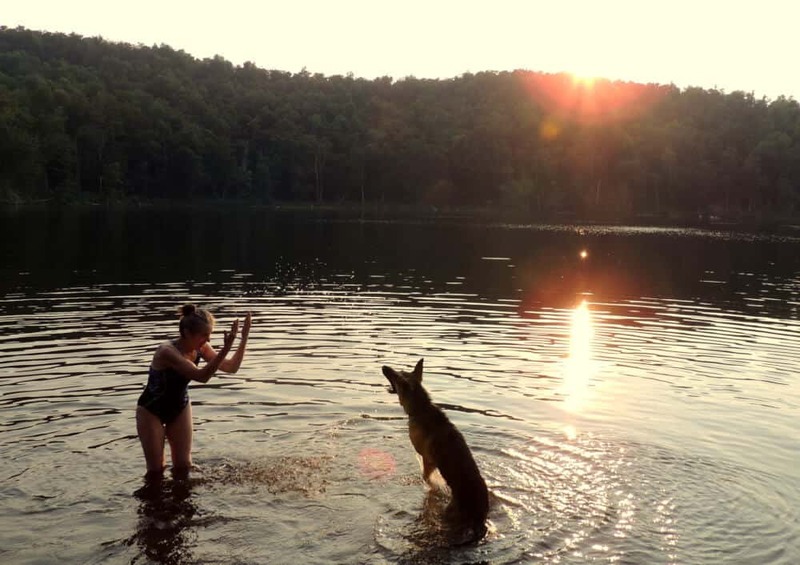 You’re planning on staying at campgrounds, and doing a lot of hiking, swimming, and other activities that are just more fun with dogs. Camping with dogs is just as much fun as traveling with dogs. Your dog won’t have much room in your car, RV, or camper. You don’t think you’ll have time to give your dog the exercise he needs. Your dog doesn’t respond to basic commands. You plan to spend a lot of time in big cities, national parks, or other destinations that aren’t dog-friendly. Your dog loves being at home and you have someone who is willing to care for him. Your dog is aggressive with people or other dogs. Your dog is not trained and hasn’t been socialized. Your dog suffers from anxiety or another illness that would make traveling painful for both of you. In order to plan a successful road trip, it’s important to take your dogs needs into consideration from the very beginning. We have had the best luck traveling with dogs on vacations that focus on outdoor activities, at least in part. It works for us because our whole family prefers being outside. Here are some planning tips to inspire you and your dog to hit the road. 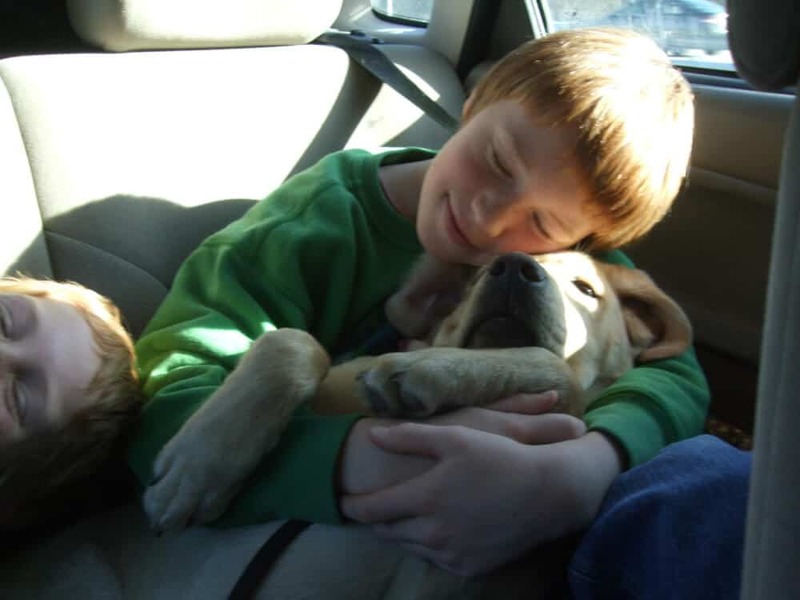 Travel with dogs can be rewarding if they like to snuggle. Inside your RV or camper at a campground – If this is your situation, you’re in good shape. Your dog can have free run of the camper, can be left alone, provided that it’s not too hot, and will be able to frolic in the great outdoors with you by his side. It’s a win-win for everyone. Inside a tent at a campground – Tent camping while on a road trip is an inexpensive way to see the country, and it’s the way we’ve always done it. The dogs and people get plenty of exercise, which makes long days on the road much more tolerable. 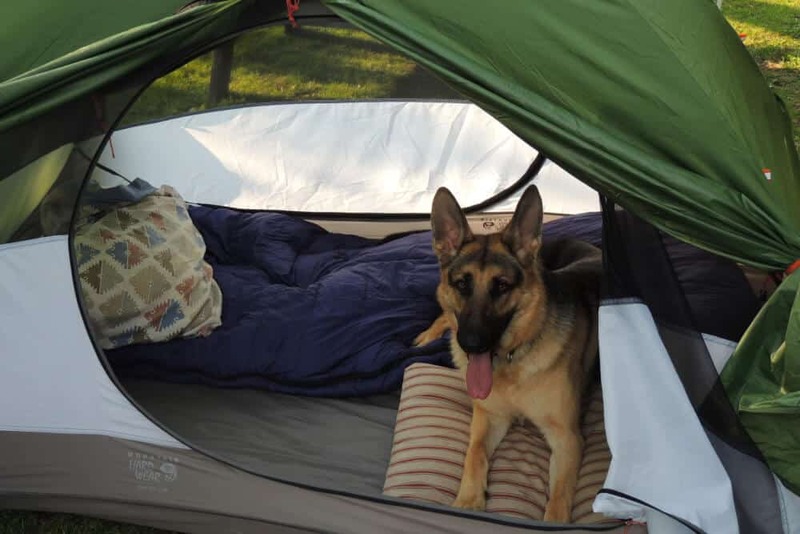 There are a few downsides to this scenario — have you ever slept in a tent with a wet dog? I promise you, this won’t be high on your list of favorites. 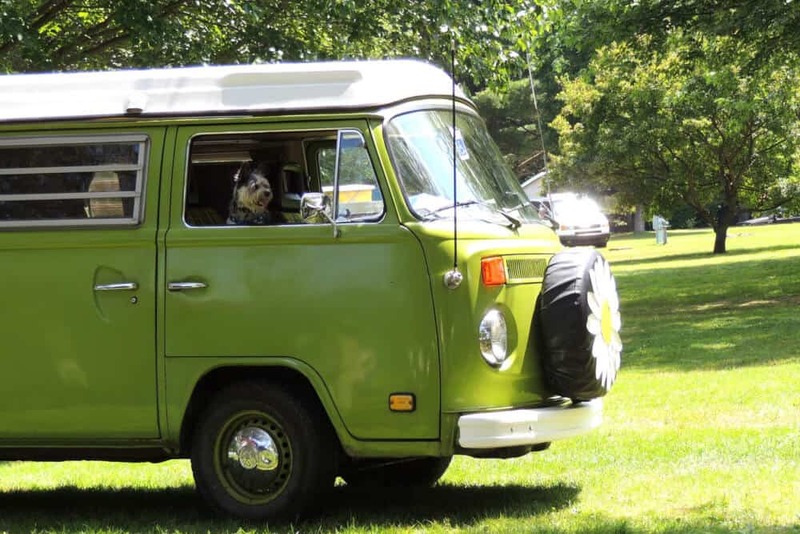 The other thing to know is that most campgrounds don’t allow you to leave your dog unattended, which means, for better or worse, your furry friend will be by your side on each and every excursion you take. In a cabin at a campground – This is an option well worth exploring, although many park cabins don’t permit dogs. Be sure to do your research ahead of time. In a dog-friendly hotel – If you’re just passing through, any hotel or motel that allows dogs will serve its purpose, but some places go above and beyond, making your dog feel like the family member that he is. Bringfido.com helps you search for dog-friendly lodging, and it’s available as a mobile app so you can find hotels on the fly. In an Airbnb or other home stay – We’ve gotten really into staying in Airbnb rentals over the past couple of years. We’ve stayed in waterfront camping cabins, a cool treehouse, several yurts, and a few really cool in-town apartments. Not all Airbnbs allow dogs, but there’s a filter you can use when searching for your perfect road-trip escape. New to Airbnb? Use this link to get $40 off your first stay. Planning and packing for your road trip is part of the fun (at least for me it is). Here’s what you need to keep your dog happy and healthy on the road. Vaccination information – many hotels and campgrounds require that you provide them with your dog’s most up-to-date vaccination records. Don’t leave home without them.
. Be sure to include an allergy medication like Benadryl for bites and stings, some waterproof tape like Vet Wrap, and a veterinary prescribed painkiller like Rimadyl (for aches and pains) or Tramadol (for more serious conditions). Flea, tick, and heartworm prevention – No matter where you travel, there’s a good chance you’ll run into biting insects. Pack your preventative of choice and don’t forget to use it. A travel bed – If you have room in your vehicle, your dog’s regular bed from home will be just fine. If you’re short on space, check out this Ruffwear Highlands Bed (affiliate link), which comes with its own stuff sack. Your dog will feel more comfortable knowing he has is own space when you stop for the night. are made of biothane, making them totally waterproof, smell-proof, and washable. They are truly awesome for adventurous dogs.
. It took us years to find the perfect pouch, and this is it. It’s really durable and roomy, and magnets keep it closed for easy access. Bones and toys – Bones are great for chewing in the car, and balls and toys can be useful when you reach your destination. Obviously this depends on your dog, but our labs never outgrow their toys. Food and water bowls – They don’t take up much space, but if every square inch counts, check out the Ruffwear Quencher Bowl. It’s totally packable and perfect for hiking and canoe trips too. Poop bags. For obvious reasons. Traveling dogs usually love open widows! Make sure your dog wears his tags. The tag should include your name, address, and phone numbers. Don’t forget to include your cell phone number in case your dog is lost on the road. Keep your dog leashed or under your voice command at all times. Traveling can be a stressful experience for your dog, and even dogs that stay close on the homefront may wander when traveling. That’s why it’s extremely important to keep your dog leashed. Well-trained dogs that respond immediately to your voice command will earn more freedom, just use your best judgment. Get your pooch microchipped. According to Petfinder, only 22% of lost dogs that entered animal shelters found their way home to their families, while 58% of microchipped dogs were reunited with their loved ones. A microchip is no bigger than a grain of rice, but it could save you and your dog a lot of heartache at home and on the road. Prevent car sickness. Did you know that mild cases of nausea and car sickness can be prevented with ginger snaps? This was news to me, but our shepherd puppy just couldn’t deal with the long, winding roads that we love. Someone recommended ginger snaps before long car rides, and our pup has been fine ever since. I recommend one a half hour before travel, and another when you get in the car. Keep your dog safe while driving. According to the Whole Dog Journal, the safest place in the car for your dog is within a secure crate or a harness restraint in the back seat. We have never had room for a crate on road trips, but we did invest in a doggy seat belt harness. Get plenty of exercise. 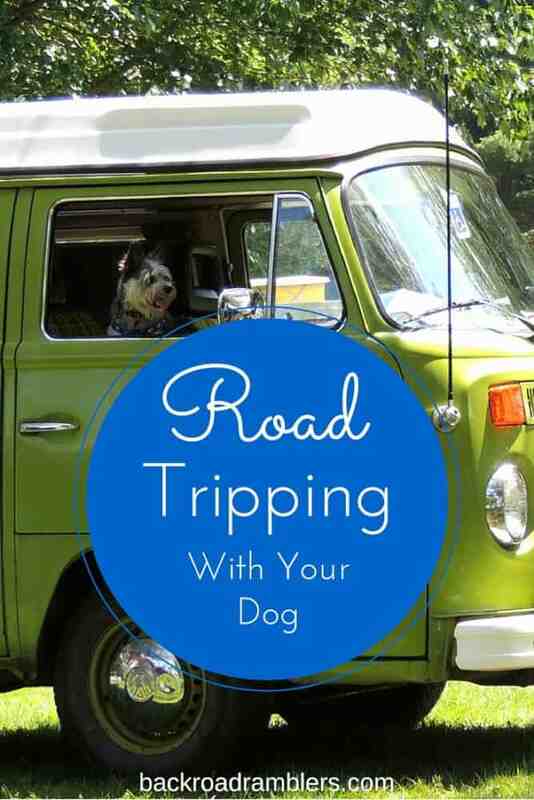 This will make long trips bearable for you and your dog. Start each morning with a brisk walk, jog, swim, or hike together. Take shorter walks throughout the day, and another vigorous romp before bed. Chew toys make car rides a lot more fun. 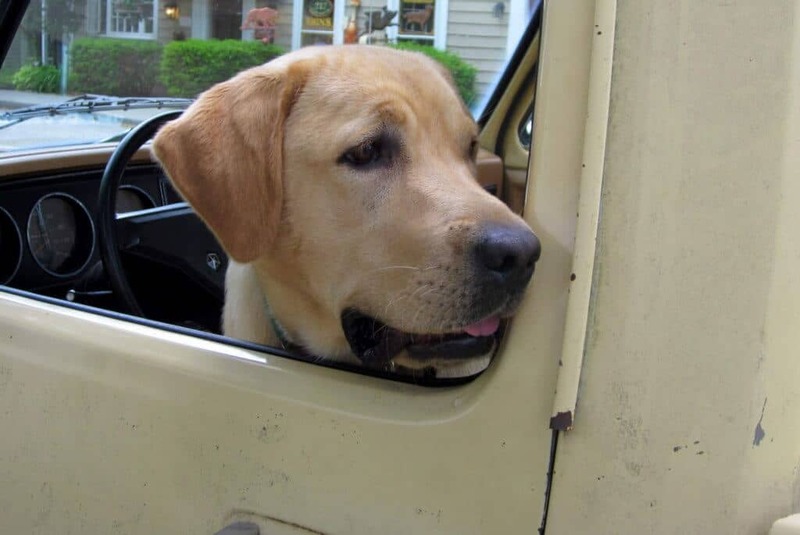 Dogs are like toddlers sometimes — they can get bored and antsy in the back seat. Protect your sanity, and perhaps your seat cushions, by investing in a stash of chew toys for the trip. Whether your dog loves real bones, nylabones, or kongs stuffed with peanut butter, you can keep a stash of his favorites hidden away. When things start to get dicey, break out the goods. Everyone will be happier for it. Depending on the nature of your road trip, there’s a good chance you’re going to encounter places that just aren’t dog-friendly. National parks come to mind, although we’ve visited several of them successfully with dogs. Dogs aren’t welcome in amusement parks, zoos, shopping centers, museums, and many other places. Big cities can be hard to navigate with dogs too. Does this mean you have to forgo all these potentially exciting destinations or leave your dog at home? You can easily make use of pet sitters along the way. DogVacay is the Airbnb of the canine world. Their network includes more than 15,000 sitters across the United States. To make use of this incredible resource, simply create an account before you hit the road, and search by zip code when you need a sitter. Whether you’re heading to Disneyland for a weekend or just a day in the big city, DogVacay will match you with the perfect dog sitter at prices that are often cheaper than traditional kennels. Road-tripping with your dog is a truly rewarding experience, provided you’ve planned ahead. The important thing is to make accommodations that reflect your pup’s needs. A trip that focuses on outdoor adventure will probably garner the most tail-wagging, but when it comes down to it, your dog just wants to be by your side. 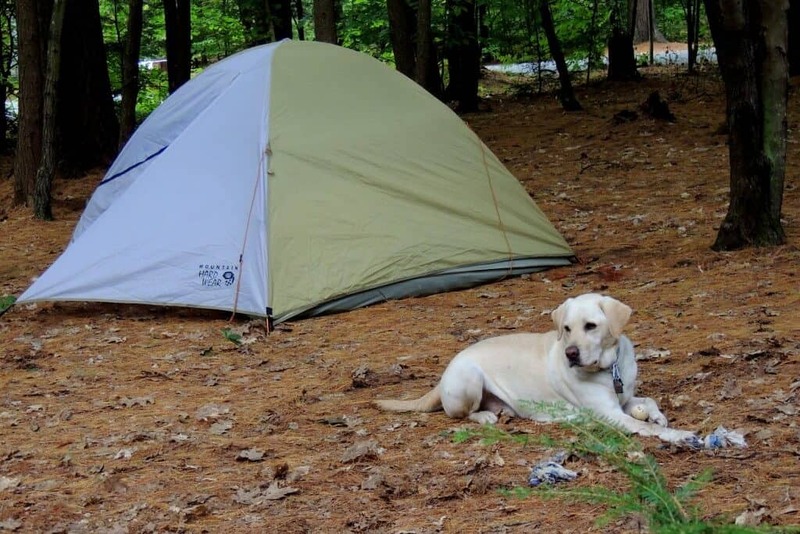 Want to learn how to camp with your dog? Check out the article I wrote for Labrador Training HQ. Good article, well done! We are planning a road trip across country with our 7 dogs! We couldn’t stand the idea of leaving any of our furry kids behind, so we’re renting an RV and hoping it all works out. The packing lists for the dogs is lots longer than for the humans. I thought I was crazy to even think about trying this but now I know I’m not alone in wanting to take my pack with me on the road! Not crazy at all! Should be an exciting journey! Good luck. Hi Tara, Great tips. I did not know that there were special dog first aid kits available. Cool, now I know. I also think that the DogVacay is cool. I’ve never traveled with my dog, but after reading your post I can see that it is definitely possible and manageable! The tips are very practical and useful! DogVacay, what a great concept! Thanks a lot for the tips, especially this one, that should make traveling a lot easier. Always good to know that you have an option of dog sitters, in case of need. Fantastic! These are such great tips! We travel with our dog all the time (road trips from PA to Maine and back). She loves the car and starts getting distressed when we’re packing for a trip, waiting by the door to make sure we don’t leave her. 🙂 Anyway, I picked up some new and really helpful tips (ginger snaps–who knew?). Thanks for sharing! I think every dog owner must read this article. Whenever I get time I take my kids and my lovely dog for a road trip. Every one loves the trip so much. Thank you, Hans. Glad you enjoyed it. Traveling with dogs can be really rewarding if you’re prepared. Great article! I love taking my dogs on road trips, we all have tons of fun! We rented the “barn” at a bed and breakfast near Tucson, Arizona. The dog run was right next to the horse ring. My dogs love being around the horses, behind the comfort of a fence. I currently RV full-time with my two elderly Jack Russell Terriers and wouldn’t have it any other way. There is definitely some sacrifice on what I am able to get to see since I can’t leave them for long periods of time unattended, but I also get to spend more time with them now than I ever have. This is great information. Though, I don’t have a dog of my own I have plenty of friends that do and this is great info I can pass along! Aw, this post is adorable! My dog loves journeys, I’ve never taken her on something that was longer than a few hours but I think I may try it now! Great tips! Wow, this is absolutely everything a person should consider when travelling with a dog! I feel sorry when I see little dogs at street festivals here in Toronto because no-one can see them and they get stepped on and crushed in the hordes. Must be scary! A friend is planning a cross country trip with their 2 pups early next year, sent this post along. Lots of interesting and handy tips here, thank you for sharing. Thanks for stopping in, and for sharing. Great post! We travelled across Canada with our two dogs 3 years ago. With careful pre-trip planning it was a great experience! Perfect tips for dog owners! My dogs adore going anywhere in the car with me, but a road trip would be a whole different ball game! I’ll keep these tips in mind if I ever decide to actually take them somewhere other than the park! This is great! We love bringing our dog everywhere and it’s fun for all of us. 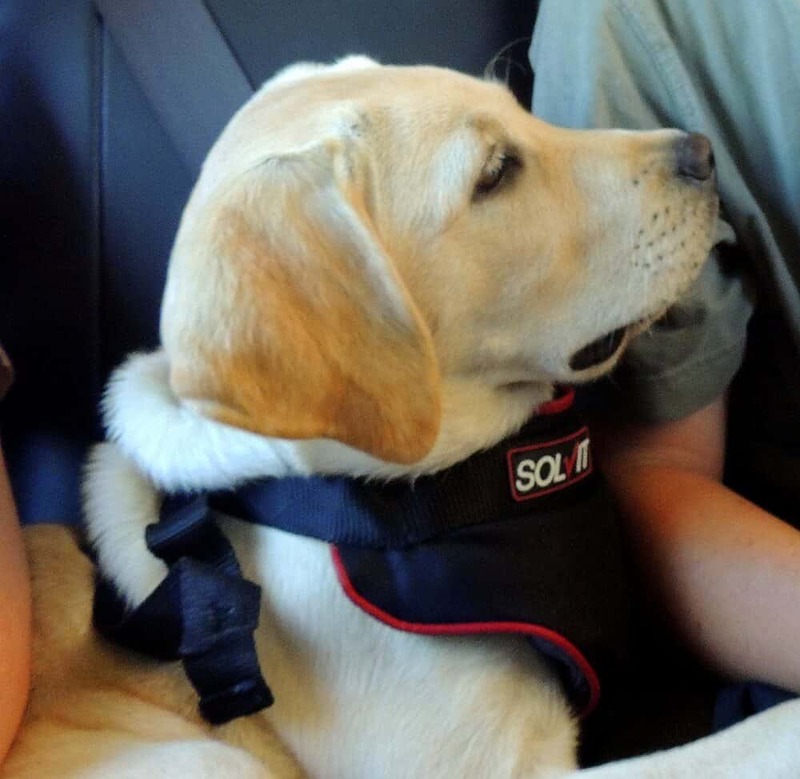 For certain trips, though, we do leave her with a sitter – we try to keep in mind what would be a good fit for her and for the rest of the family. Love the pictures in this post! Thank you, Faye. Vacations are more fun with our dog, but also more work. We try and find balance, and of course, having a sitter that you love and trust makes all the difference. Really good advice. We love our little sweet dog but there are definitely family trips that she wouldn’t enjoy. There is a lot to think about. Yeah, our dogs don’t really like going to the big cities, but then again, neither do we. Dogvacay.com is a really great resource when you don’t want to bring your dog along. Comfort Inn, and any of those hotels that have the glass doors leading outside at every room are great for travelling with your dog, easy access to take them in and out to pee without having to go through the main part of the hotel. Also good because they can see out the doors and know when you return. Also, bring LOTS of paper towels for messes and spills and towels to clean up. Drive-in movie theaters are great on vacation as puppy can sleep in the car or cuddle while you watch a movie! This was a really good post, I travelled a lot with both my dogs and these are great things to know. I’m so glad you stopped in, Hil. I don’t have much experience with hotel rooms and dogs. We’ve done it, but never happily. Thanks for sharing your tips and the link-up. I’ll be sure to check it out on Thursday. There are awesome tips! I’m obsessed with my dogs and love to travel. Whenever we are away I miss them SOOOO much and always wonder what they’re up to. I’m not the biggest fan of road trips and def. not an outdoors-y type of person, but your tips have me contemplating how much fun it would be to explore a new place with my fur babies! Thanks for stopping by, Roxy. Our dogs are what made me love the outdoors. Their enthusiasm is contagious! Thanks for stopping in Ting. Raising dogs prepared me for raising kids… and I think both tasks are more fun on a road trip. I love Monday Escapes!